While I definitely loved exploring Bangkok and getting to know the city, I can’t say that I loved the destination. 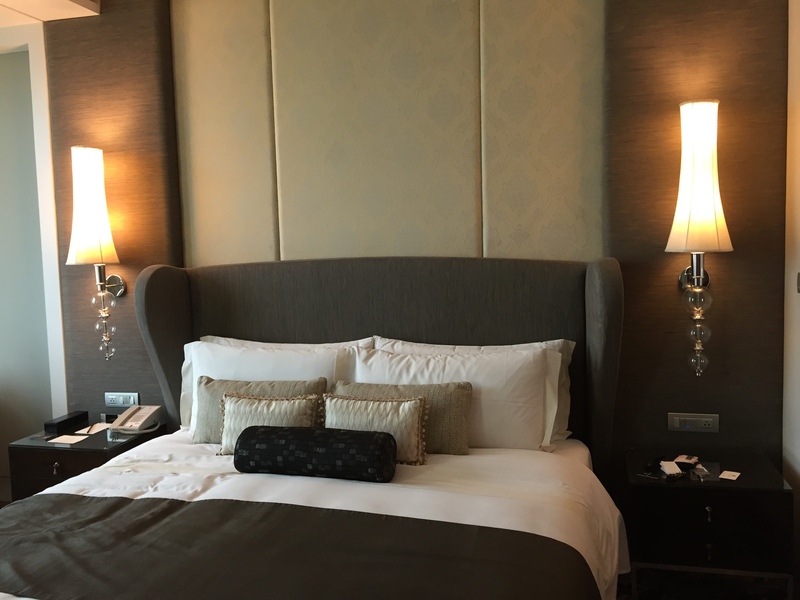 But, I can 100% definitively say that I absolutely adored the St. Regis Bangkok and I would return just to spend more time there. The hotel is in a high-rise building and it has the typical city hotel layout with a small lobby on the ground floor and a larger reception lounge on a higher floor. Usually, the ground floor lobby can feel like a corridor from front door to elevator and the space gets wasted. That is definitely not the case at the St. Regis Bangkok. They make great use of their ground floor space with a concierge desk, casual cafe, and two restaurants (one with a Japanese menu and the other featuring an Italian menu), both with outdoor patios. The upstairs reception lounge has 2 more restaurants and a great bar. I loved that the layout seemed to constantly keep people circulating, but it never felt hectic or crowded. I tried two of the four restaurants and, considering the menus have an international flare, I wasn’t sure if they could pull off such a vast variety of dishes. I was really impressed with the food quality, the dish creativity, and the top-notch service! 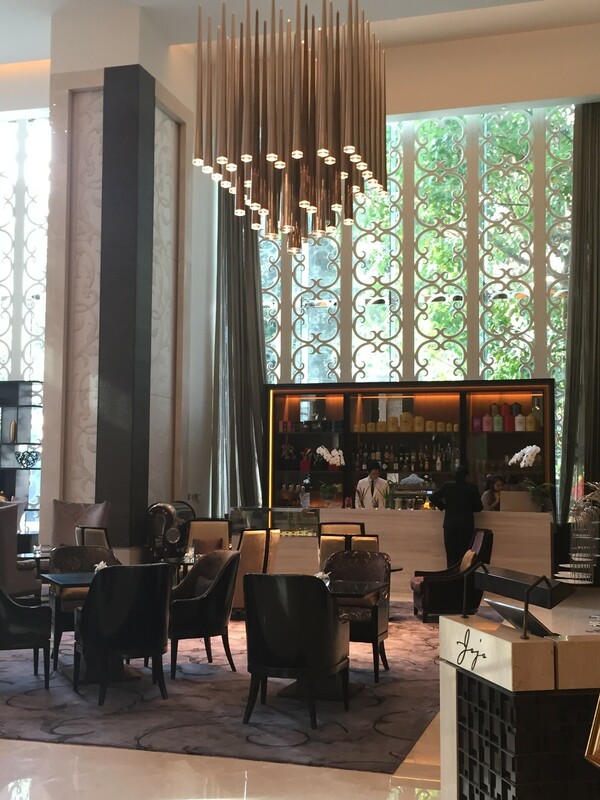 If you’re lucky enough to stay at the St. Regis Bangkok for multiple nights, you’ll definitely want to look into the weekly specials at each of the hotels to plan which nights to dine and which restaurant. While I was there, they had themed nights with really great pricing including a mussels special, an Italian prix fixe menu, etc. And, of course, I can’t stay at a St. Regis and not try the local Bloody Mary! The Bangkok version, the Siam Mary, includes Thai chilis, wasabi, lemongrass, and Thai basil. 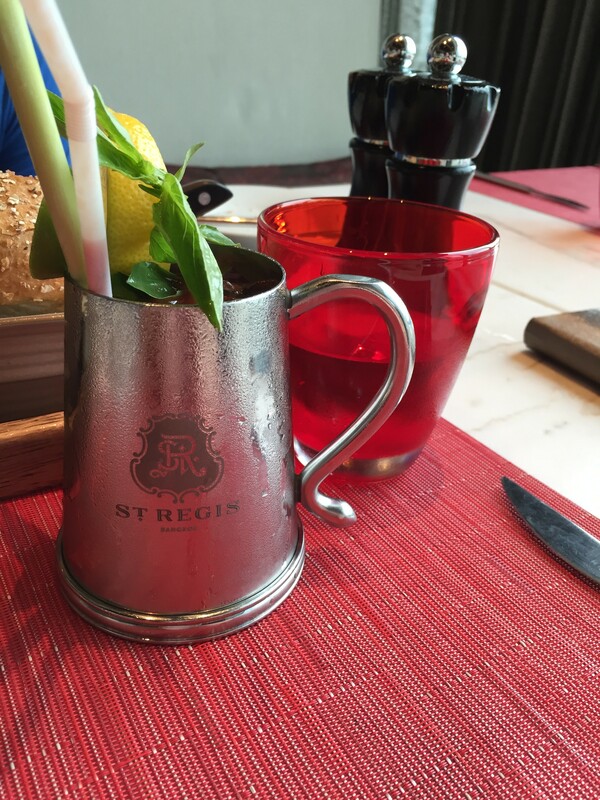 You can find the recipe for the Siam Mary along with all of the St. Regis specialty bloody mary recipes here. The rooms here are not particularly large or spacious, but the layout is so well organized that it hardly matters. Some people might not like the open bathroom layout, but it wasn’t a problem for me with the sliding partition doors. As always, the deep soaking tub was a highlight for me and I love the Remede bathroom amenities; it is one of my favorite scents. If I had more time, I would have loved to spend a day in the Elemis Spa where the steam rooms, jacuzzis, wading pools are available complimentary to all guests. 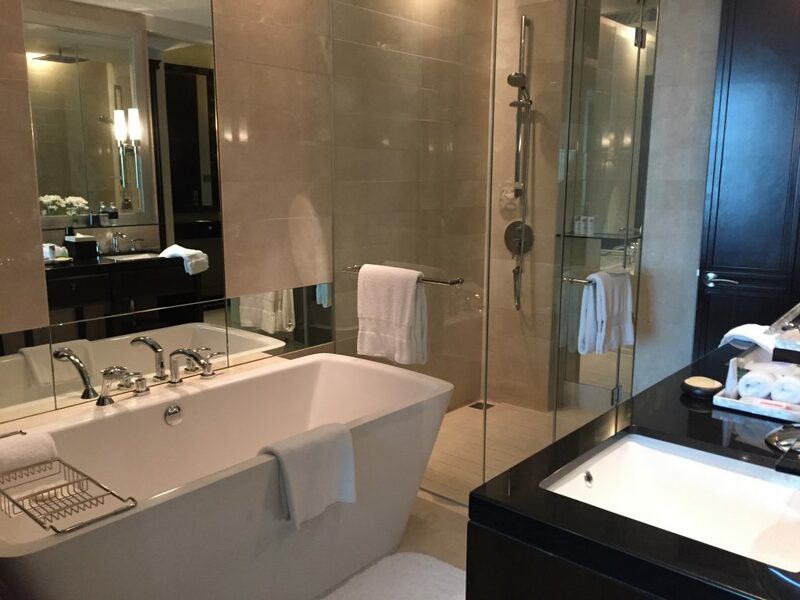 Open-concept bathroom in a Grand Deluxe Room at St. Regis Bangkok: sliding walls to the left and right of the photo close off the bathroom to the rest of the room, but it is open by default. Lumpini Park is just the next block over from the hotel, which is perfect for morning joggers or an afternoon stroll. I had a blast wandering around and spotting the monitor lizards! If you’re feeling hungry and brave, there’s an abundance of street food stalls nearby! A Skytrain station is also conveniently attached to the St. Regis building so the entire city is at your fingertips! This entry was posted in Asia, City Destinations, Hotel Reviews and tagged Bangkok, St. Regis, Starwood, Thailand. Bookmark the permalink.